Unless you’re part of Gen Z, chances are you’ve at least heard of the Watergate scandal, so I’ll skip the American history lesson (for now). During my tenure living in the district, I’ve witnessed my fair share of political scandals. 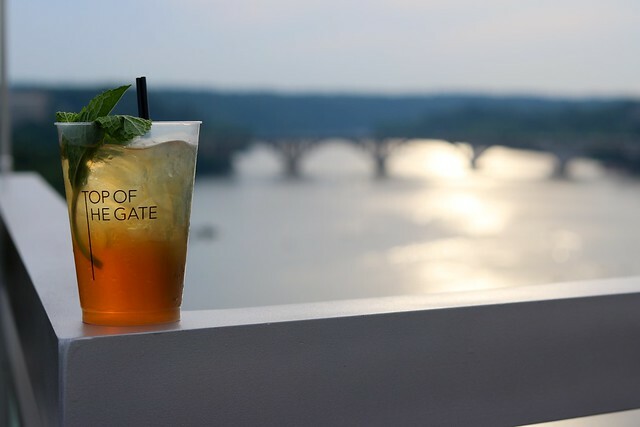 It only seemed appropriate to spend one of my final evenings as a resident of the nation’s capital at the beautifully renovated Watergate hotel. I was curious to see what nine years of renovations and $200 million could produce. Robert Muehlich, Director of Food & Beverage is the master behind the cocktails at the Top of the Gate. Muehlich is no stranger to the luxury hotel dining scene, as he spent most of his career developing programs at the top travel destinations in Miami. If that was any indication of what to expect, we were in for a real treat. 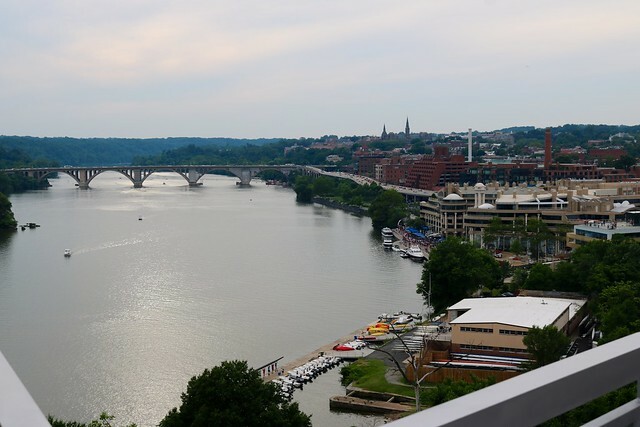 Top of the Gate at the Watergate Hotel offers stunning views of the Potomac River, Georgetown, Rosslyn and other areas of the city depending on where you venture. The wrap around roof offers lounge-style seating as well as high top bar tables. 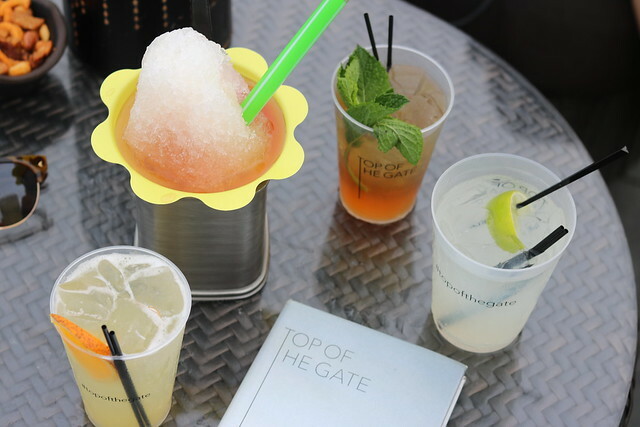 In our extensive rooftop hopping experience we’ve found that there are typically two types of vibes: laid back and edgy or pretentious and stuffy. The Top of the Gate certainly skews more towards exclusivity than inviting. 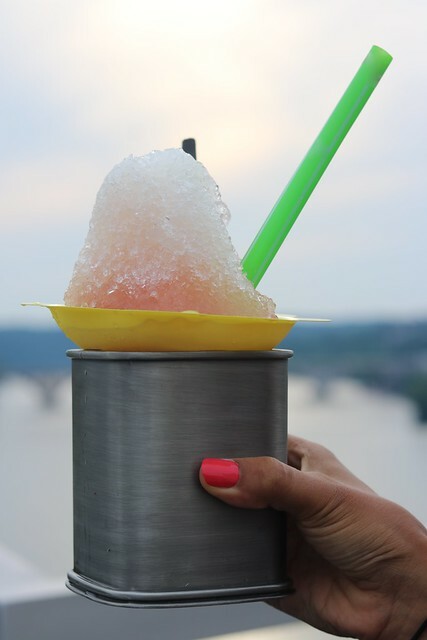 We did appreciate playful nods such as personal pizzas served delivery style and boozy snow cones. Top of the Gate surely feels like an escape from the heart of the city. I grabbed my dynamic duo of best gal pals for elevated cocktails on a lovely summer night. The crowd is certainly more mature than the watering holes we tend to frequent. We noticed a number of dates as well as groups of men suited up. While we enjoyed the bar, it wasn’t necessarily our scene. Rooftops are generally notorious for overpriced drinks and mediocre cocktails, but the vibe tends to justify spending a pretty penny. 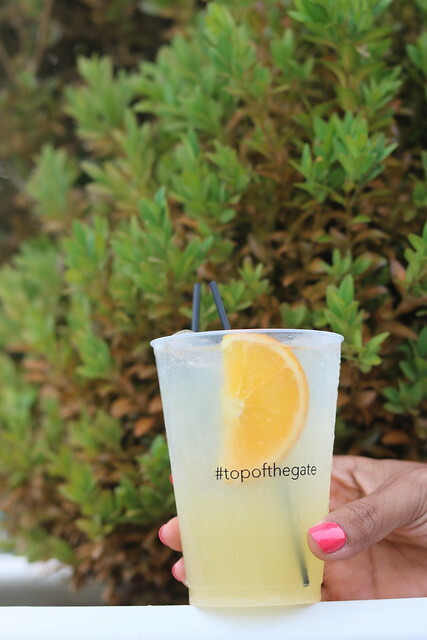 Top of the Gate is pretty standard with $16 for cocktails served in plastic cups. We were surprised to see how limited the cocktail menu is, offering just four libations. We noticed a much more extensive beer and wine menu. We didn’t have much choice but to order one of each. Manisha tends to stick to what she knows and a mango moscow mule seemed to be a safe choice. The mule was a nice variation featuring Ciroc mango vodka. The drinks were rather small, but quite strong. I had opted for the Pico Pineapple, which calls for flor de cana, black pepper and honey syrup. I wasn’t sure what to expect, but I was pleasantly surprised by the tangy concoction. Our Whiskey gal, Jen had to order a chamomile julep with Bulleit bourbon. The combination of chamomile and mint complemented one another. The bourbon was far too strong and overpowered the mint for a julep. I couldn’t quite call it quits without trying the 1972 Hawaiian ice, especially on a hot summer night. Shaved ice and snow cones are generally my jam so I had to taste test this spiked. The Hawaiian ice was rather underwhelming and difficult to consume as it melted almost immediately. The ice was spiked with cassis, limoncello, pineapple and cherry. While all of those flavors sound delicious in theory, it was a disappointment in comparison to the rest of our experience. Cheers! 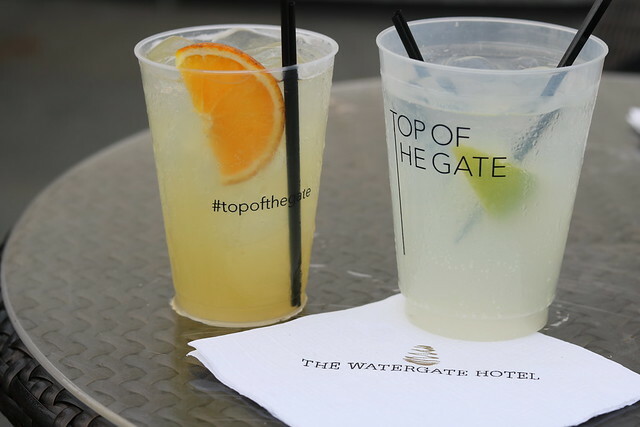 For sweeping views and cocktails combined with historical relevance, the Top of the Gate is certainly a D.C. staple worth visiting once.